Something that hasn’t been mentioned much in the post-privatisation analysis is the amount of money the Royal Mail stands to make out of its immense property holdings. One building alone in the company’s portfolio of disused offices in London – the mail centre in Nine Elms Lane – has been valued at half a billion pounds. That’s one-sixth of what the government sold the whole company for. The office was closed in 2012, more than a year before the sell-off. And it’s not the only one. Dozens of delivery offices up and down the country, including mine, were closed in the run up to privatisation. Several of them remain unsold. Could the offices have been kept empty on purpose? Royal Mail bosses now stand to make a lot of money out of the company they once used merely to manage. Royal Mail’s management don’t regard you as customers but recipients, simply a way to deliver returns to their investors. From the Guardian, Comment is free. 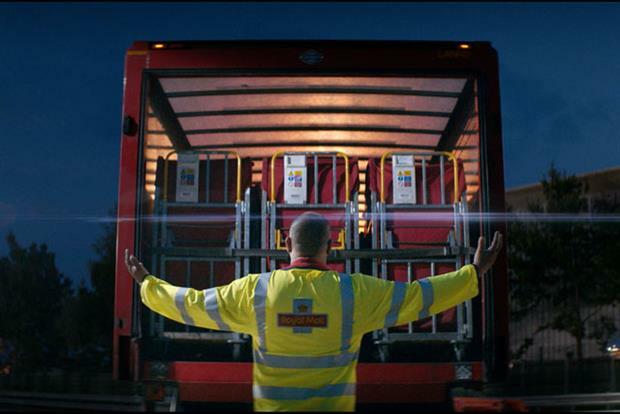 The first TV advert from the Royal Mail since privatisation was shown over the weekend, during the X Factor, and Downton Abbey. 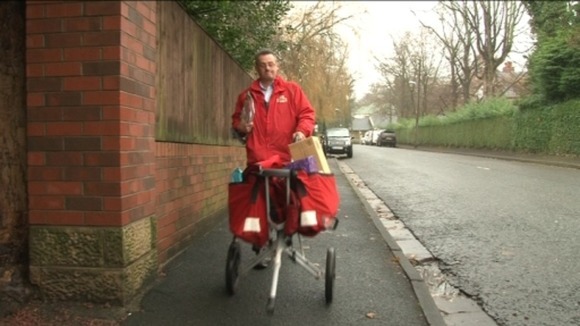 The advert features the Royal Mail Choir, singing their version of the Beatles’ All You Need Is Love, while postmen and women deliver parcels to their appreciative customers. And there you have it: the hypocrisy of advanced capitalism in precisely one minute. The Royal Mail delivers none of that. It doesn’t deliver love. It doesn’t deliver diversity. It doesn’t deliver a welcoming smile. It doesn’t deliver to stately homes, to garages or to birthday parties. It doesn’t deliver hope and anticipation. It doesn’t deliver mail to remote communities. It doesn’t deliver friendliness in the rain. It doesn’t even deliver parcels. We do all of that: the men and women of all backgrounds and ethnicities who work for the Royal Mail. That’s our job. 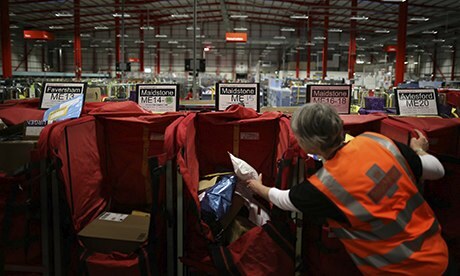 Now that it is privatised, the Royal Mail’s job is simply to deliver returns to its investors. For a long time now the Royal Mail has been divided, between management and postal workers, between those who see it as a business, and those who see it as a service. The people who commissioned that advert are the former rather than the latter. It’s not a service to them, it’s a way of making money. “Granny Smith” is the postal worker’s affectionate nickname for you, the customer. Or rather, for the people that we regard as our customers, the people we meet on the doorstep everyday. But the Royal Mail management doesn’t regard you as their customers. They don’t meet you but once in a lifetime. You are merely the recipients of the mail. Their customers are the people who send the mail in large quantities: the utility companies, the banks, the advertisers, the bulk deliverers, the people who churn letters out by the tonne using advanced computer systems, the mail-shot companies using lists they’ve purchased from other advertisers, the conveyors of junk mail and other unwanted material, the people who fill up your halls and your bins with garbage, the landfill merchants. Those are the Royal Mail’s customers, not you. The people they make the money off. See: that’s the hypocrisy of that advert. They know that postal workers are held in high regard by the public. They know that most of us will go out of our way to look after our customers, that we will do our best even in adverse circumstances, that we will give that cheery smile in the rain. That was always the case in the past, though it’s getting rarer and rarer as time goes by. In the old days, we loved our job. It was great getting out and about, on the streets of our towns, delivering the service we knew you wanted. The work was energetic but satisfying. It brought us face to face with our neighbours. And we had a little time to spare back then. There were enough of us doing the job to get the work done and still have enough time left over to lead lives of our own. Fifteen years ago, the average delivery span was two and a half hours. That’s two and a half hours of high-octane energy expenditure: a workout by any other name. It kept us fit, it kept us happy, it kept the endorphins flowing to our brains. It kept us smiling. We would get up early to greet the dawn and have the mail on your doorstep by breakfast. Ten years ago the delivery spans were increased to three and a half hours. These days the average delivery span is four to four and a half hours. After two and a half hours of intense work the endorphins cease flowing and the pain starts to kick in. We walk till we ache. We no longer have time for our customers and we’re so dog-tired at the end of the day that we don’t even have time for ourselves. We eat, we sleep, we work, that’s all. There’s no energy left for anything else. This is called “productivity”. Less posties doing more work, at a faster rate. In the past decade the company has lost 50,000 jobs, with more job losses promised now that it has been privatised. Less jobs means more work for me. More hours on my feet. More weight in my trolley. More gates, more doorsteps, more letter boxes. More endless miles of trudging drudgery on the streets of my town. The choice of the X Factor and Downton Abbey to air the advert was very telling. The X Factor represents the illusion of capitalism, that we may find a way out of its servitude one day: that some of us, at least, through good luck or talent, will be given the keys to escape. Downton Abbey represents the reality: a servant class serving a privileged elite. As a public service our service was to you, the public. As a privatised monopoly our service will be to the shareholders from now on. One of my neighbours came over to say hello the day the Royal Mail was privatised. ‘I expect you’re looking forward to getting your hands on all that money you’ve just made,’ he said. The shares allocated to me as a member of staff had gone up by almost 40 per cent in a day. The government had brought forward the date of the IPO in order to beat a strike ballot by the Communication Workers’ Union. Most of us, like most people, were against the privatisation. It felt like my neighbour was congratulating me on taking a bribe. I lost my temper, and told him what I really thought about the privatisation. I pointed out the contradictions: that the state has spent billions of pounds of public money to subsidise the bargain basement sell-off; that the pension fund was nationalised to sweeten the deal; that the loss-making Post Office was decoupled from its more successful partner and retained in public hands; that pricing restrictions were lifted in anticipation of privatisation, allowing the company to increase its profits. None of this has got anything to do with the free market. This is direct government intervention to create a rigged market. If the price restrictions had been lifted ten years ago, the entire argument for privatisation would have disappeared overnight. My neighbour said that governments shouldn’t be involved in the business of running companies. He said that privatisation would allow the company access to future investment. He said that previous privatisations had been a great success, and cited British Telecom and British Airways as examples. He said that taxpayers were fed up with subsidising the Royal Mail. You hear that phrase ‘wealth creators’ a lot. It is a commonly used justification for the privatisation agenda, the idea that these individuals generate wealth by their investment. They are the ‘wealth creators’, and we are the beneficiaries of that wealth. It’s a form of magical thinking, like the pharaohs believing that their rituals were responsible for the flooding of the Nile, a post hoc fallacy: because they have invested in the company and increased their wealth, their investment somehow ‘created’ the wealth. The actual wealth creation, the work that my colleagues and I do, in this version of reality, is an accidental by-product of the process, a privilege I am allowed by the goodwill of these magically endowed individuals. Moya Greene, the chief executive of Royal Mail, has already told us to expect job losses. Very soon I expect to be begging for the privilege of working longer hours for less money. Vince Cable’s efforts to keep the Royal Mail in the hands of “blue chip investors” and away from “spivs and speculators” was delivered a blow this week when it emerged that the Children’s Investment Fund has taken a 5.8 per cent stake in the company following its privatisation earlier in the month. The fund was founded by Chris Hohn, described as a “locust” by German politicians, and damned by the former CEO of Deutsche Börse, Werner Seifert, for his part in scuppering a previous business deal. The London-based hedge fund has bought 58.2m shares or 5.8pc of Royal Mail. Under stock exchange rules, TCI had to declare its stake when it reached 5pc of the company. The threshold was reached on Friday. Mr Cable has often criticised hedge funds for being short term investors and has repeatedly insisted that Royal Mail would be sold only to “long-term, blue chip” institutional investors. Meanwhile Chancellor of the Exchequer George Osborne has responded to criticism that the government had sold off the Royal Mail too cheaply. At a Thomson Reuters Newsmaker event on Tuesday, he told his audience that initial public offers are routinely offered at a discount and the government had followed advice from its bankers on details of the sale. “On all fronts it has been a great success,” he said. And in the House of Lords, Labour peer Lord Sugar, star of TVs The Apprentice, questioned the expertise of the banks which had been advising the government on the sale. He demanded: “Why did these so called experts sell the stock at such low levels and get it totally wrong to such an extent that the stock rose by 33 per cent the day afterwards and since then 54% on the issue price? Government spokesman Lord Popat said the key objective had been to “secure value for money for the taxpayer”. For those of you without a calculator, it means that three banks, UBS, Lazards and Goldman Sachs, share £18.4 million between them. According to a letter in the Guardian prior to the Royal Mail’s flotation it “is purely the Treasury’s insistence on keeping to the UK’s unique borrowing rules, which are not followed by any other country.” The government-owned French energy company EDF, and the German transport company Arriva, have no such limitations, and operate freely in the UK. The Royal Mail was already classified by the Office of National Statistics as a public corporation and could have enjoyed the same freedoms as state-owned companies elsewhere in Europe. All that was needed was for the Treasury to adopt the same rules as other countries have had for decades. 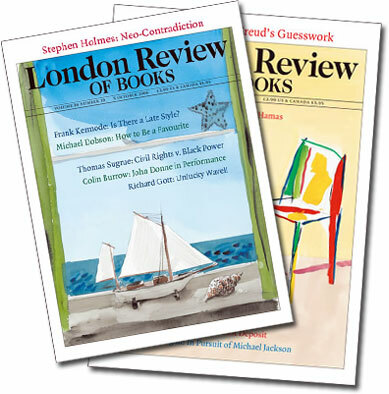 The writer, John Perry, adds: “It continually surprises me that opponents of Royal Mail privatisation have not pursued this argument, especially as it addresses one of the government’s main arguments in favour of selling it off. Given that the government have already made a similar rule change in favour of the publicly rescued banks, there is a clear precedent for such a change in favour of Royal Mail.” This would have rendered privatisation unnecessary, he says. In other words, it’s one law for the banks, and another for the Royal Mail. The price of Royal Mail shares has increased by almost 50%, from 330p to over 500p. Thousands of investors have made huge profits just days after their initial investment. Almost 700,000 small investors purchased £750 worth of shares and have witnessed an instantaneous increase in their value. 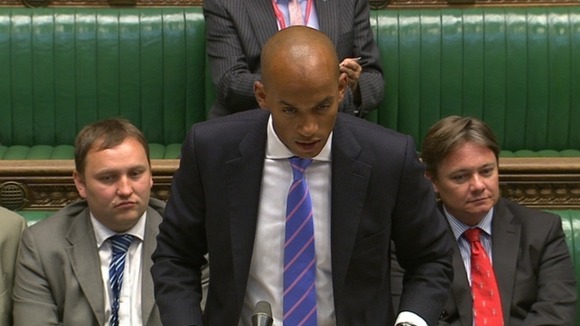 The government are under scrutiny for having undervalued the price of the Royal Mail. It is the taxpayer who is set to pay the price for the government’s mistake as investors, large and small, are set to continue to benefit. In the past few days the Royal Mail’s market value has soared to over £5 billion representing a £1.7 billion increase. The Secretary of State for Business Vince Cable has responded by branding the share price increase as “froth” and has encouraged people to focus on the long term implications of the sale. It is thought over 100 million shares were purchased in the first hour of trading and an estimated 700,000 people were given 227 shares worth £750. The unusually high demand has lead some commentators to question why so many people are investing in them and whether the government did in fact completely undervalue the business. Cable has asked people to think about the long term future of the Royal Mail, and has indicated that he has attempted to keep the company in the right hands. Almost 40,000 people who tried to acquire more than £10,000 worth of shares were denied any form of sale. It is also thought that government denied a number of city investors and hedge funds in a bid to keep the business out of their hands, although 70% of the shares did, in fact, go to large investors. Cable said that demand across the country was so large that the government was able to stop shares being sold to “spivs and speculators” and instead could focus on sales to “responsible long-term institutional investors”. Meanwhile, the National Audit Office will launch an inquiry into the allegations that the business was undervalued.